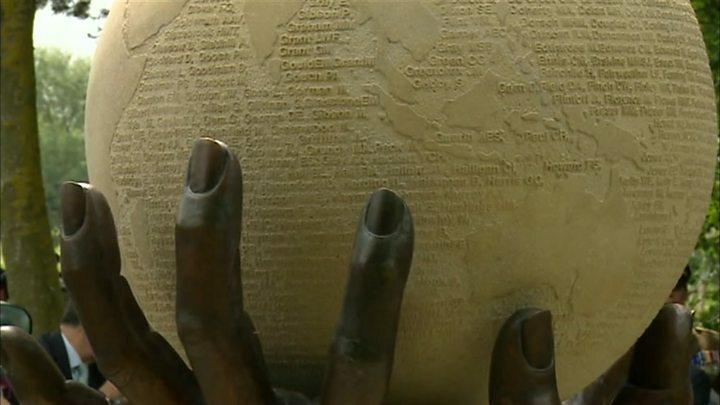 Nurses who gave their lives in wartime will be remembered with a new memorial. A service of dedication was held for the monument at the National Memorial Arboretum in Alrewas, Staffordshire, attended by the Countess of Wessex. The piece commemorates the work of professional and Voluntary Aid Detachment (VAD) nurses in World War One and World War Two. It carries the names of nearly 1,300 nurses who died during or as a direct result of their service. The Nursing Memorial Appeal has been working for more than six years to fundraise for a permanent monument to nurses. At the unveiling was Ethel Lote, 97, from Aldridge, West Midlands. A teenager at the outbreak of World War Two, she began work as a nurse at Burntwood Military Hospital in Staffordshire, caring for the first convoy of injured soldiers from Dunkirk. She said: "They were still in the uniforms, just how they had been picked up from the beaches. "We had the first 100 patients. It was terrible, I'd just started training as a nurse, to see these men and their injuries, a lot of them were burned or had shrapnel wounds." VADs from the British Red Cross and the Order of St John travelled from across the world to help during wartime, but the appeal said they received little recognition for their service.